What do Buzz Lightyear and a Dior fashion show have in common? A line of hats that seems to march to infinity – and beyond? – and more reasons to love the recent Dior ready-to-wear fall/winter fashion show in Paris. 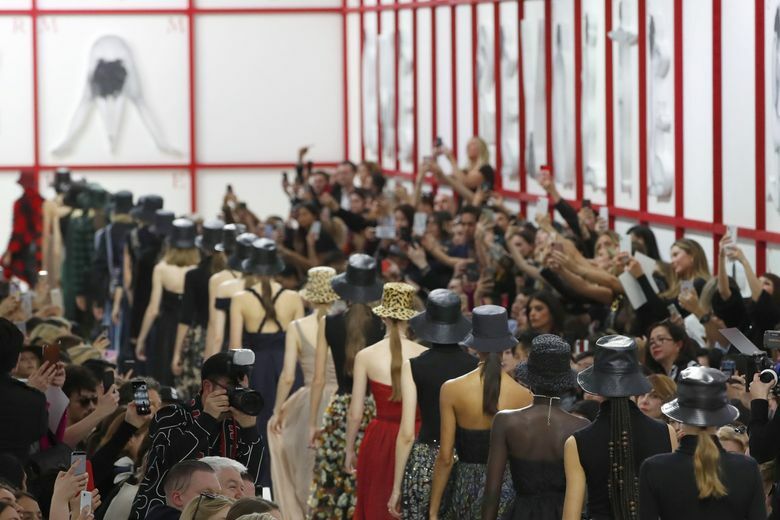 OK, I know you can’t see the outfits terribly well in this photo of the recent Dior ready-to-wear fall/winter fashion show in Paris, but here’s why I love it all the same: 1) That row of hats, seemingly marching off to infinity. (I’d like to think that all the models tossed them to the sky at the end of the show, but I suspect they didn’t.) 2) The way that you can still get a sense of the silhouettes: trim waists, fitted tops and full skirts prevailed. 3) All those people on the right, holding up their cellphones as if waving. 4) The photographer in the foreground on the left, wearing a wonderfully besquiggled black-and-white jacket and clearly living his best life.